Hello friends, I hope you are all well! Another one of my crafty friends is having her birthday today. Both Andreea and I attended a fabulous Online Card Class last year, called Clear and Sheer. 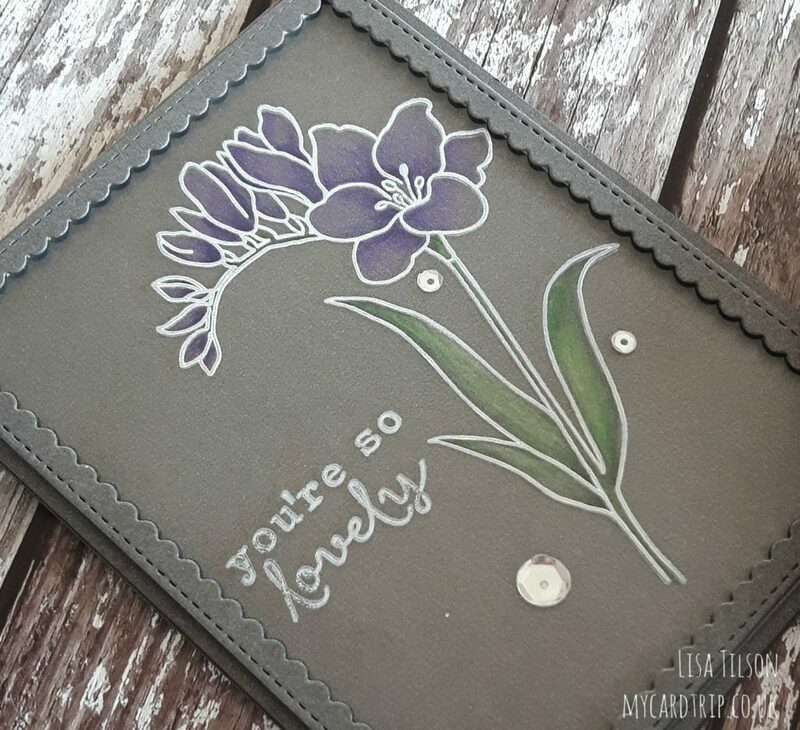 This class was all about using vellum and acetate in your cardmaking. So, I wanted to make a card for Andreea which used acetate. Here is my card for today. It is very similar to a card that Shari Carroll made during the class – I cannot link to it from here as you need to attend to see it in full. 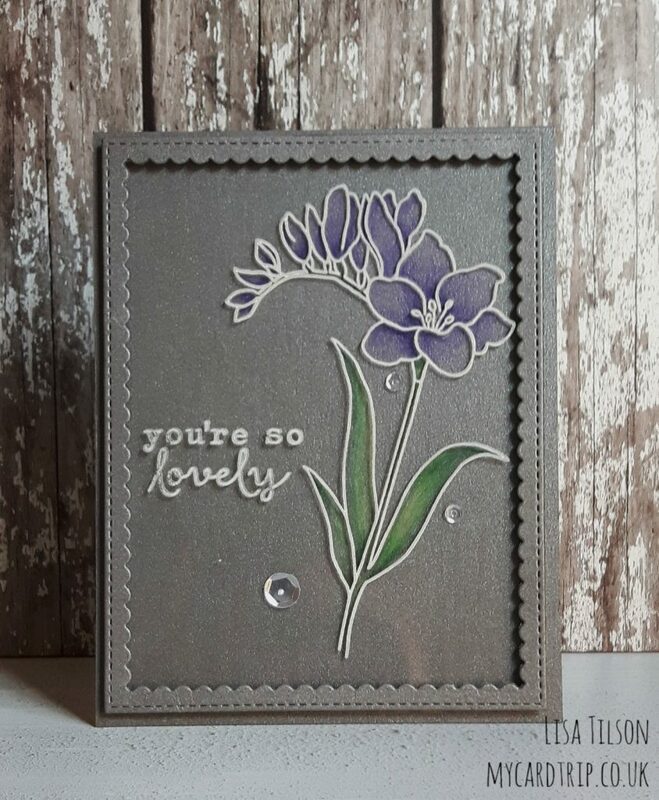 Shari used a different stamp and colours, and added some different details, but it is heavily inspired by her card. If you watch the trailer for the class, you will see a sneak of her version. It’s a beautiful card. For this card, it is really useful to have a MISTI as you need to line up your acetate stamped image with the stamped image on the base card. To begin I cut a base card from a pearlised grey cardstock measuring 11″ x 4.25″ to make an A2 card. I then cut some acetate measuring 5.5″ x 4.25″. I stamped the image onto the acetate using White Staz On, twice, so that it would have a really defined outline. I then did the same on what is going to be the front side of the grey base panel. Because I used the MISTI, I didn’t need to reposition my card or acetate or image, so it is really useful for this technique. I put the acetate image on one side to dry and set about colouring the image on the base card. I used a selection of greens, purples and a yellow for the colouring. I love the look of pencils on a dark background. I then cut 2 stitched scalloped frames and glued them together. I also stamped a sentiment onto the acetate panel. And I also added some sequins to the base card at this point. Now, here comes the tricky bit. Before I could adhere my frame to the acetate panel, I needed to make sure it was all going to line up with the image below. To do this I took the acetate image and attached it to the base card using washi, so it was aligned perfectly and wouldn’t move around. I then adhered the frame to the acetate and then removed the washi. At this stage, I now know my frame is in the right place! Next I put a layer of double sided foam tape on the back of the acetate image and then adhered it to the base card making sure that the images were completely aligned. So that finishes my card for today. I have been wanting to try this card for ages, so I am glad I had an excuse to finally make it. Thank you so much for stopping by, and I will be back soon with another project. In the meantime, I wish you all a wonderful weekend. Other: Acetate, Grey Pearlised Cardstock, White Staz-On, Studio Katia Majestic Fusion sequins, Double Sided Adhesive Tape, Double Sided Craft Foam. Sorry for my late comment ! 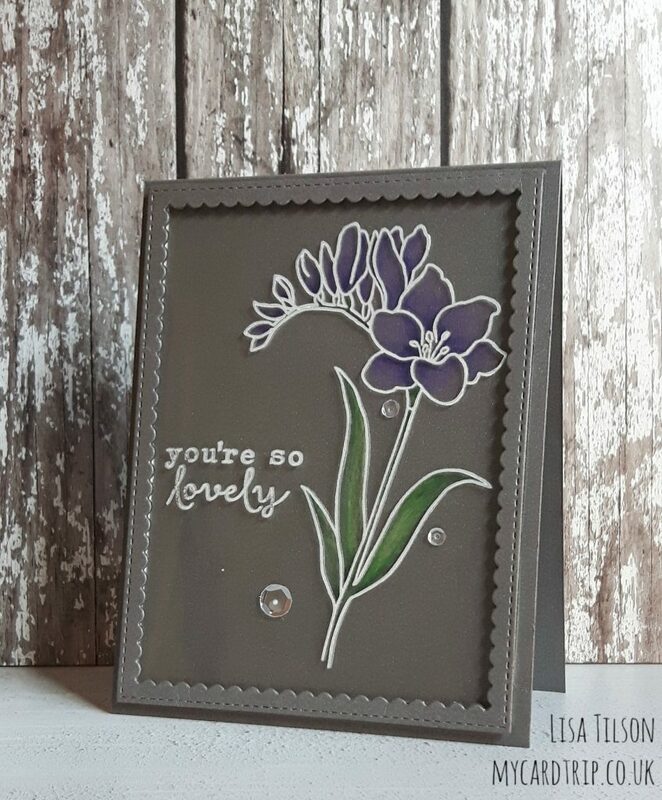 Another stunning card Lisa ! You definitely rock acetate Lisa ! This is another fabulous technique that I have to try one day ! 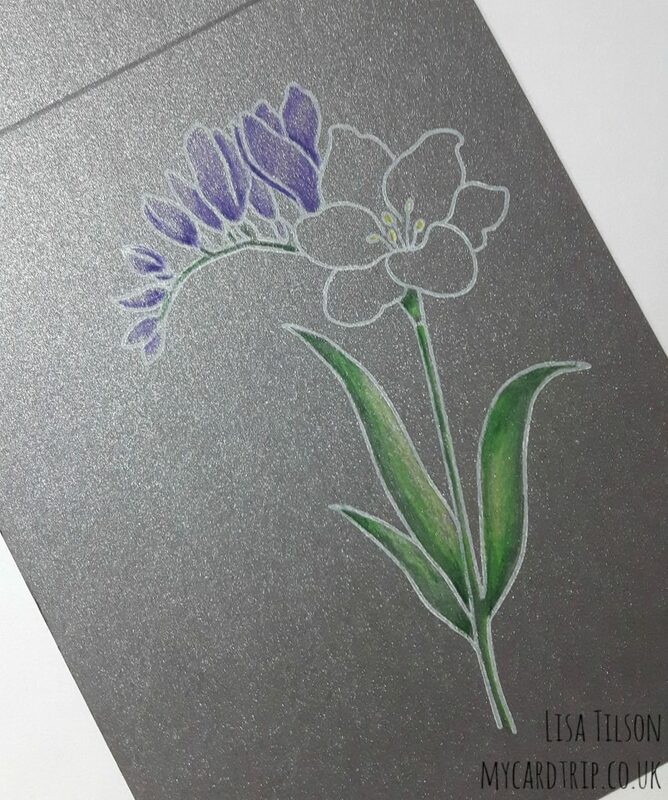 I love the result of colour pencils on the grey cardstock ! Gorgeous ! Thanks so much for sharing and inspiring.